For this round of the Arcade Gacha we have released 14 different characters that can be worn or left around and used as messengers. The Emotes as we call them, are fully customizable in their bubble text area. You can either add a text or a picture, to show how you feel, or to send out a message to your friends. We really love our Emotes and we thought it would be fun to do a little photo contest to spread the love around. The Emotes can be found exclusively at The Arcade Gacha Event. Please read the rules and join us! The theme is ‘Chill Pill’ and is celebrating the 90s. Our memory runs back to our bedrooms filled with stuffed animals and cute things that friends from school give us as presents. 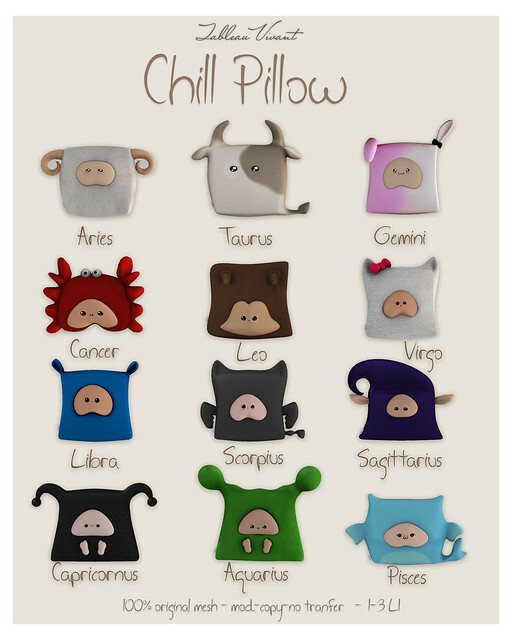 The Chill pillows are no transfer but you can always send them as gift through our vendors! New newness from Tableau Vivant!!! We have a couple of very different items out at two very successful events this month! For Fameshed we have released a very masculine and fashionable vest perfect for the summer. Tableau Vivant Long Vest was created to match our Zaaf pants and is 100% original and rigged mesh; it and comes in 6 colors, Black, Metal, Olive, Gray and Camel. We encourage you to try a demo of the vest before purchasing as in order to avoid using the alpha we made it a little oversized, so please try the demo for a little while with your favourite AO first, in case your shape needs some adjusting. It’s Arcade Gacha time!! 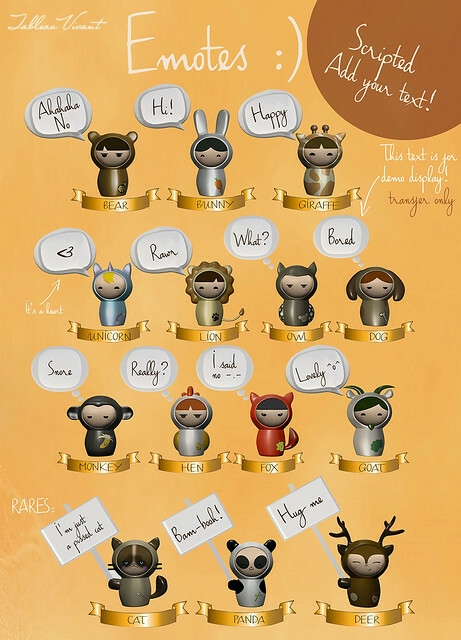 For this edition we did something new, playful and fun for you all. Emotes are our cartoon-like characters, 100% original mesh that are fun to wear and use to send messages to your friends with! Emotes are fully scripted so you can easily change their text, you can either wear them or leave them around if you want to give a message to a friend or a loved one! Taxi to the Arcade Gacha!! Still available @ Collabor88 Merrick cape in six colors: Azure, storm, susnet, cloud, lighr and water. Please remember to try the demo!